Diving back into the open waters of ritual medicine music that have come to define Liquid Bloom’s iconic blend of ceremonial instrumentation and exotic sound design, world electronica producer Amani Friend’s latest release “ReGen: Lucid Remixes” transforms Liquid Bloom’s signature downtempo flavors into a sprawling world of rippling textures, fluid rhythms and four-on-the-floor beats. A dramatic departure from the original Re:Generations album, as well as the soothing and atmospheric ReGen: AtYyA Remixes released in the summer of 2017, Lucid Remixes explores a much wider range of kinetic intensities and energy levels, with contributions from eleven of Amani’s most talented producer contemporaries. Juxtaposing dance floor rhythms with emotive instrumental melodies and vocal samples, the collection speaks to the shifting landscapes of world music in its fusion of classical and tribal sounds with hyper-modern tech elements. 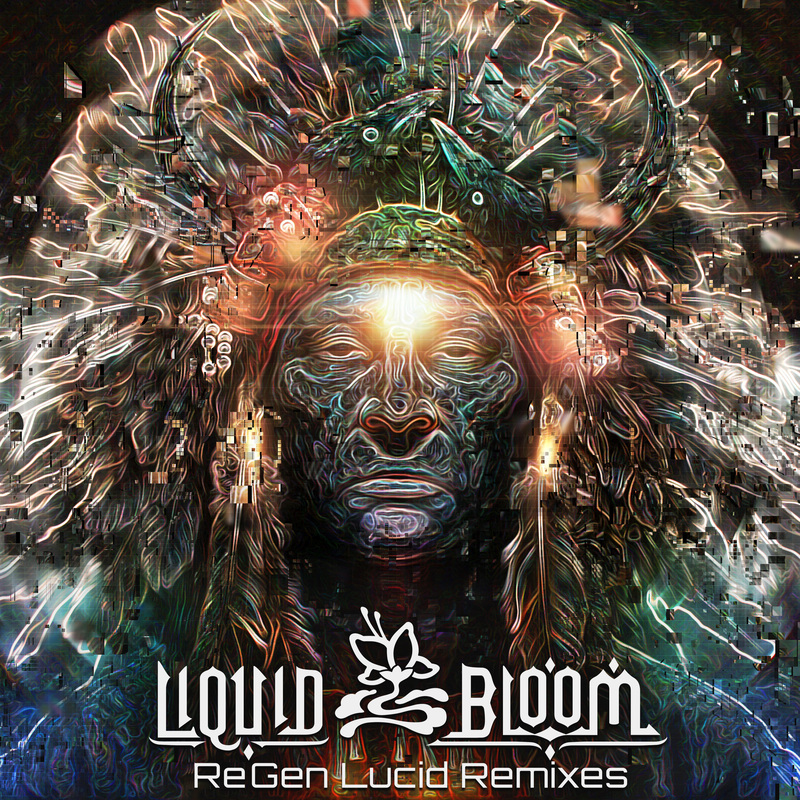 Not only do the tracks blend each artist’s identity with Liquid Bloom’s shamanic roots, but in bringing these divergent sounds together, the collection offers up the rare opportunity for reflection, expression and ecstatic movement in a singular open environment. This alluring union is most evident in Hedflux’s raw and hypnotic “Roots of the Earth” remix and Kaminanda’s luminous, mid-tempo twist on the soothing instrumentals of “Sacred Blessing.” Pairing the standout vocal elements of the original tracks with powerful synthetic energetics, each track transports us to a polarized emotional space inspired by two distinctly different approaches to beat-centric music and rhythm. Yet, staying true to the meditative tones of the original Liquid Bloom tracks, Lucid Remixes also offers up a diverse selection of soothing and contemplative tracks that invite us into a realm primed for interior exploration. Contributions from downtempo projects like Yaima, Numatik, Erothyme and Momentology hold up this end of the release and help preserve a large segment of the distinctly organic and beatless recordings that lie at the heart of Liquid Bloom’s overarching sonic identity. Of course, with Amani’s widely recognized project Desert Dwellers remaining a distinct part of his musical career, psychedelic influences arguably remain the driving force behind the Lucid Remixes. Tribone’s high-energy revision of “Resonant Migration” marries dark, churning beats with the rapturous sounds of Australian vocal sorceress Deya Dova, while on the other end of the psychedelic bass spectrum, French psydub-duo Land Switcher weaves a delicate, pulsating web of textures and liquid rhythms in their surrealistic “Fire Gathering” remix—perhaps the most scintillating and unearthly track in the release. Bookending the array of beat-driven tracks making up the first half of the album, Nanosphere’s intoxicating opening dub remix of “Emerging Heart” plays homage to the downbeat tones of Re:Generations opposite Suduaya’s growly, tribal bass reimagining of “Fire Gathering.” Interestingly, it is these more energetic but unintrusive tracks that invite the listener in from the silence and act as the transition point into the uplifting second half of the collection, perhaps revealing some of the methodology that inspired Amani’s diverse selection of remixers. Ultimately, ReGen: Lucid Remixes proves a resounding success on multiple fronts in its offering of music tailored to a full spectrum of emotional states and energetic levels. Far more than a mere collection of remixes, the album showcases extensive planning and communication on behalf of Amani and his collaborators, and proves a remarkable stepping stone in the growth of the Liquid Bloom project.